I've been meaning to try making (and drinking) a shrub for at least 3 or 4 years now. I'm not really sure why I've waited so long, seeing as they couldn't be any easier to make. So, when you think shrub, does your mind automatically go to the bushes outside your childhood home? Or, if you're like me, a little TLC song might start playing on a constant loop in your head. (Yes, I know it's scrub, not shrub. I can't help the way my mind works.) What I'm really referring to are the shrubs that are also known as "drinking vinegars". Basically, you macerate fresh fruit or berries with sugar until the fruit is soft and the sugar is dissolved, then you add vinegar and allow the mixture to infuse for several days. You can add fresh herbs or spices for different flavors. 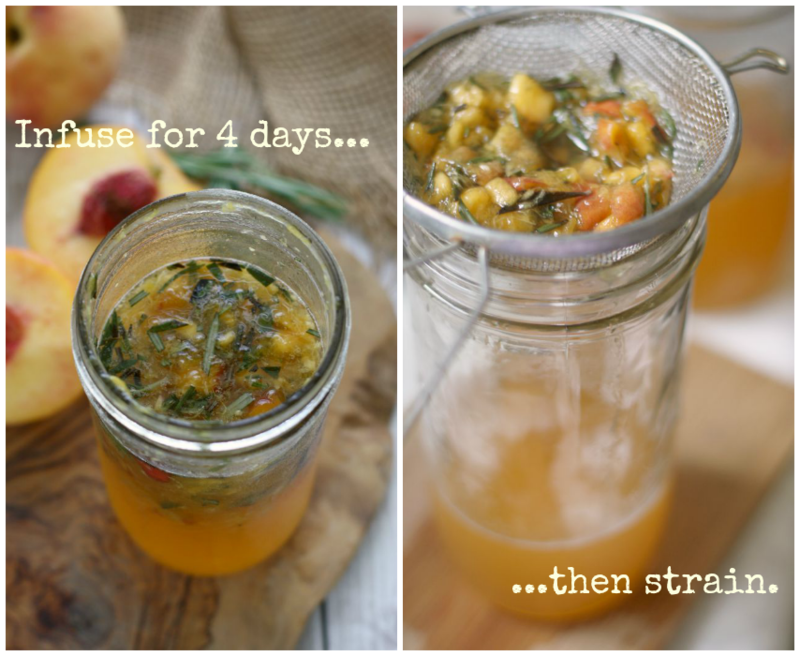 Once the mixture has infused, you strain out the solids and use the resulting sweet and tangy syrup to flavor things, usually drinks (though you could use it in vinaigrettes or sauces, as well). Since I had bunch of peaches getting ripe really fast on me, I knew a peach shrub was in my future. I also wanted to add an herb to it in honor of this month's Progressive Eats Cooking with Herbs menu, so I chose rosemary. Okay, I chose it because had a big bunch that was going to go darkside on me if I didn't. But it wound up being a beautiful combination. I just finished the last of my syrup. I've been pouring a tablespoon or two over ice, then topping off my glass with club soda. It's become my new favorite cool-off drink—it's SO incredibly refreshing. I can't wait to make a few more batches this summer with different types of fruits, berries, and herbs. Oh, I hear tell that they make a great cocktail, too. Believe it or not, I haven't tried that yet (I know, you don't believe it)—but you can bet that there are shrub cocktails in my very near future. 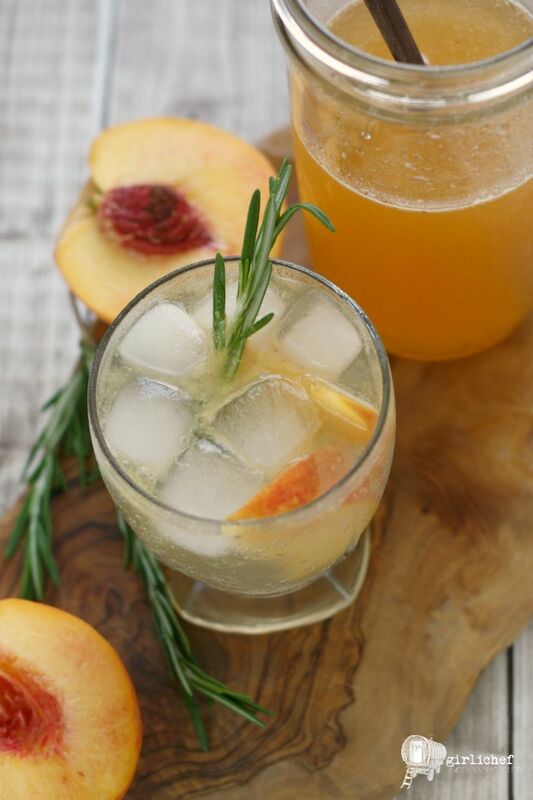 Use this sweet and tangy peach and rosemary shrub syrup to add a bright burst of flavor to cold drinks. 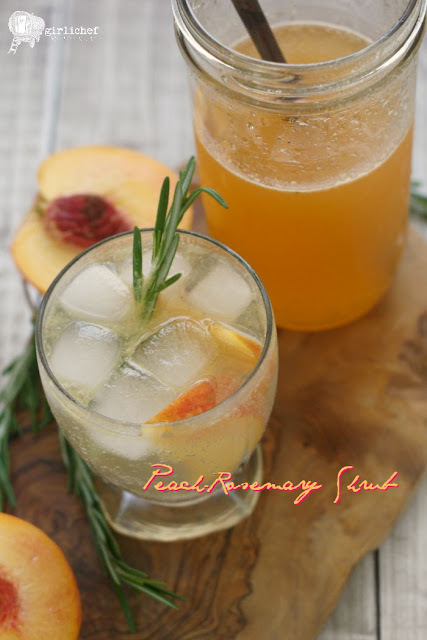 Combine diced peaches, sugar, and rosemary in a 1 1/2 pint jar; use a muddler to smash and smoosh everything together until the sugar has dissolved. Pour in the vinegar, put the lid on, and give it a shake. At this point, the shrub is ready, but you can store in covered in the fridge. 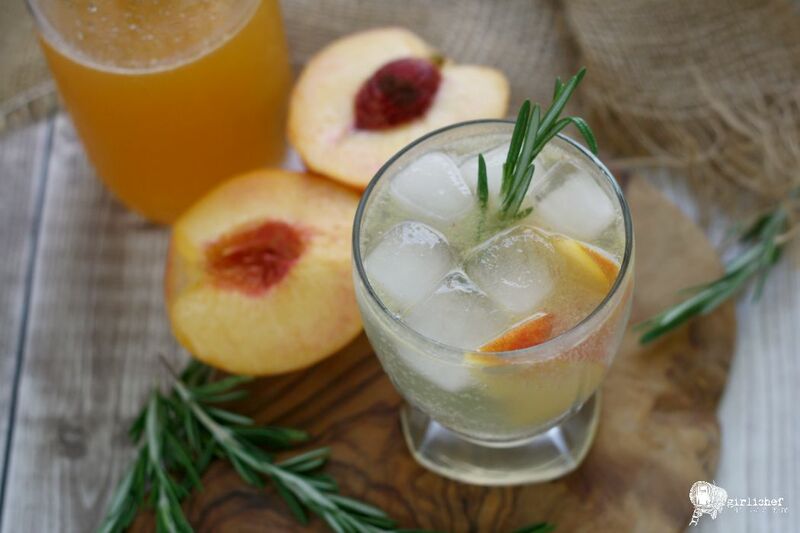 Switch up with seasonal fruit, different herbs (or leave the herbs out), and different types of vinegar for all sorts of fun, fruity, and refreshing tangy options! Welcome to Progressive Eats, our virtual version of a Progressive Dinner Party. Our host this month is Progressive Eats creator Barb Kiebel of Creative Culinary, and today we are featuring recipes that show off some of those amazing herbs growing this time of year. If you're unfamiliar with the concept, a progressive dinner involves going from house to house, enjoying a different course at each location. With Progressive Eats, a theme is chosen each month, members share recipes suitable for a delicious meal or party, and you can hop from blog to blog to check them out. After a successful first year of more traditional themes, this year you’ll see us doing more open-ended themes beginning this month when we’re Cooking with Herbs...and anything goes!